Bamyan In Viman Nagar Is Serving The Best Afghan Kebabs In Town! Attention All: Bamyan Is Serving Authentic Afghani Kebabs In Pune! You heard that right! 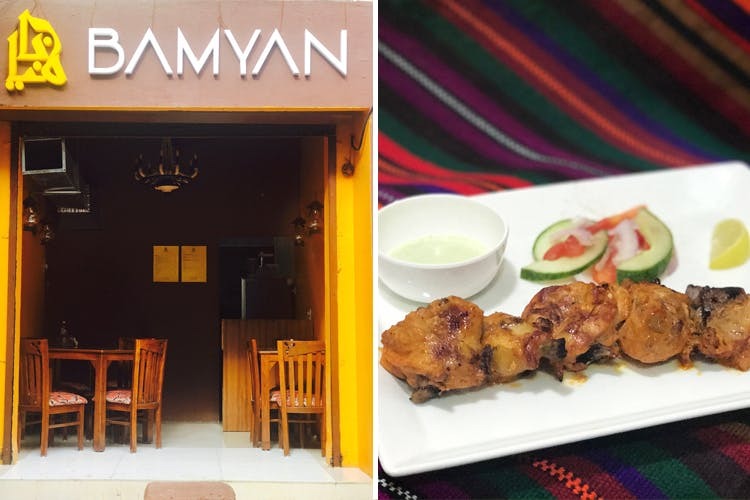 Bamyan is serving up some delicious authentic kebabs right here in Viman Nagar! Named after a town in Afghanistan, Don’t be fooled by this tiny little joint that could seat an average of 6-8 people.What we can assure you is the kebabs will disappear just as fast they are served. The staff is all Afghani as are the cooks, rest assured if you never knew what an authentic middle easter/afghani kebab tasted like – You will now! Look out for their Mumtaz Kebab which is a Flattened Juicy Piece of Meat Grilled on Charcoal Grills with a very special marinating, served with salad and Chutney and a generous portion of rice. They also serve authentic Kabuli Pulao which is Afghan Stew rice mixed with Raisins, carrots and obviously – MEAT. You can also find Dough here. An Afghan refreshing yogurt drink similar to salted Lassi, with cucumber and mint. They also serve 3 kinds of Qurma, a delicious Persian dish that contains meat and split yellow peas. For all the vegetarians out there – They have a paneer option too! Their Saffron and Mint tea is to die for! They will be starting deliveries soon but for now don’t think twice for we don’t know how much longer this new little restaurant will remain a secret! Do yourself a favour and go here for some melt-in-the mouth kebabs.